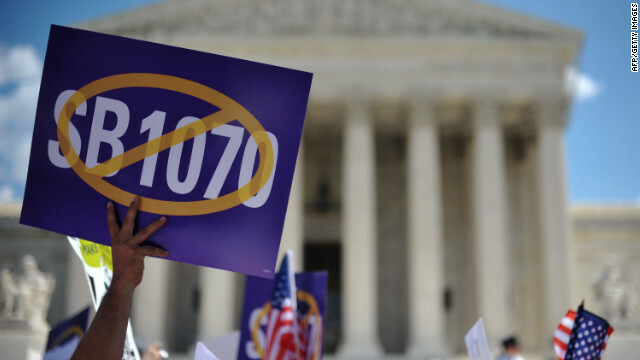 A protester holds a placard during a protest against Arizona Senate Bill 1070 on April 25, 2012 outside of the US Supreme Court. (CNN) - A coalition of civil rights organizations has filed a motion in federal court seeking to block an Arizona law that requires officers to make immigration checks while enforcing other laws if "reasonable suspicion" of illegal immigration exists. The so called "show me your papers" provision is perhaps the most controversial aspect of Arizona's tough immigration law, SB 1070. The U.S. Supreme Court last month, in response to a challenge by the Justice Department, struck down three provisions of SB 1070, but upheld the police immigration checks. The civil rights groups asked the court to block implementation of the law while they make their case that the provision is unconstitutional. Even though the Supreme Court upheld the provision, the civil rights organizations say they are presenting new arguments and new evidence against it. In the motion, the organizations argue that the provision in question will result in extended detentions while statuses are being checked, violating the Fourth Amendment protections against unreasonable searches. What don't these people understand about the fact that they are here illegally? Are the police not supposed to target criminals? But I guess it's just fine that I as an american citizen must prove everyday that I am an American citizen with a clean criminal background just to get on the gates at work every day. So what's the problem with asking an illegal alien for his papers? They are the criminals after all, and they should be targeted. Don't want the Law? Talk them in to leaving on their own. Problem solved. Otherwise? If the shoe fits? Wear it.